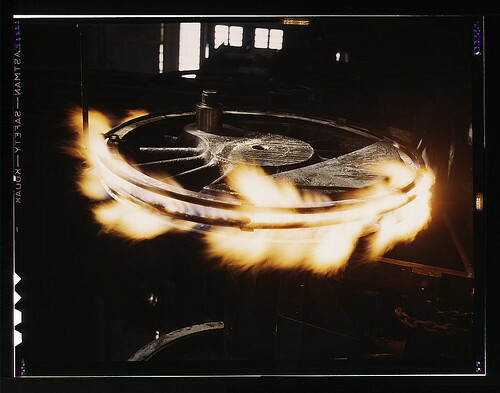 ~Retiring a locomotive driver wheel in the Atchison, Topeka, and Santa Fe railway locomotive shops, Shopton, near Fort Madison, Iowa. The tire is heated by means of gas until it can be slipped over the wheel. Contraction on cooling will hold it firmly in place. Santa Fe R.R. What a cool picture! It tugs at my artistic side...I adore working with/shaping metal. Unfortunately, circumstances as they are, I don't get to play as I'd like. Quote of the Day: Some people say, “Never let them see you cry.” I say, if you’re so mad you could just cry, then cry. It terrifies everyone. The author of Bossypants was born on this day in 1970. I once watched a show about a metal artist who used blow torches... wow, would I have like to try that. Too bad for me, it just wasn't possible at the time. Omygosh, long ago I watched a show on some famous glass blower artist. It was absolutely extraordinary. Yeah, I don't think my lungs would tolerate it, either. But it sure would have been neat to try.